We're just three months into 2015 but Google has already processed copyright takedown requests for 100 million allegedly infringing links. This is a significant increase compared to last year, and one that hasn't been without controversy. In recent years copyright holders have overloaded Google with DMCA takedown requests targeted at the company’s search results. The number of requests issued has increased dramatically. In 2011, the search engine received only a few hundred takedown notices per day, but in the same period it now processes more than a million “pirate” links. 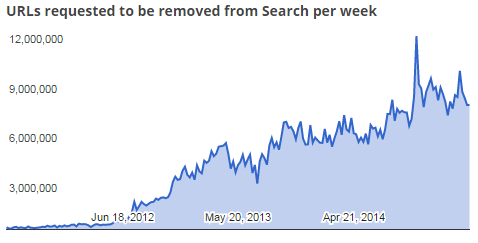 A few days ago Google received its 100 millionth takedown request of 2015. The counter is currently at 103,218,572, which means yet another record. Last year it took a month longer to reach the same milestone. If the numbers go up at the same rate throughout the year, Google will process half a billion allegedly infringing links during 2015. Most of the reported links are legitimate and the associated links are often swiftly removed from Google’s search results. However, with the massive volume of reports coming in, mistakes are also made. In recent weeks we have received several reports from site owners who have had their homepages removed from Google, even though they don’t link to any infringing material. File-hosting service Rapidgator.net had its homepage removed for the third time, for example. And the Dutch subtitle site Ondertitel.com suffered the same fate. In neither case a counter-notice proved to be successful. However, the pages were quickly restored after TF asked Google about the errors. In Google’s defense, the company must be overloaded with DMCA counter notices. But if the numbers increase this type of collateral damage will only get worse, so there has to be a reliable system in place to quickly restore falsely removed content. Another problem for Google are the increased levels of general complaints from copyright holders, who increasingly expect Google to do more to tackle online piracy. Responding to this commentary Google implemented a significant change to its search algorithm aimed at downranking sites that often link to copyright-infringing material. 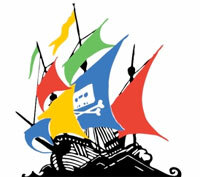 At the same time, however, Google also reminded copyright holders that they too can do more to prevent piracy. “Piracy often arises when consumer demand goes unmet by legitimate supply. As services ranging from Netflix to Spotify to iTunes have demonstrated, the best way to combat piracy is with better and more convenient legitimate services,” the company noted. Faced with complaints from both rightsholders and site owners, it’s impossible for Google to please both sides. For now, they are stuck in the middle, hoping to keep the boat afloat in a storm of takedown notices, without changing course too drastically.